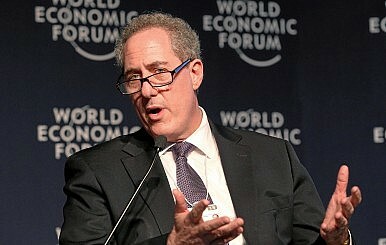 US Trade Representative Michael Froman at the 2015 World Economic Forum. U.S. trade policy toward China needs to be positive-sum, not zero-sum. As Congress decides whether to grant trade promotion authority (TPA), which would formally allow U.S. President Barack Obama to negotiate the Trans-Pacific Partnership (TPP), the surrounding debate reveals much about attitudes toward economic globalization and, in particular, toward China’s rising clout in the international economy. It reflects a broader misconception among many lawmakers, who embrace the outdated notion that economic relations constitute a zero-sum game, according to which excluding China from multilateral trade deals and international institutions is in America’s interest. In a speech at Nike’s headquarters to promote the TPP, Obama recently claimed that if the U.S. does not write the rules of trade around the world, China will. Yet a strategy toward China that fails to adequately include the country would actually diminish America’s ability to do just that. China’s decision to try and set up its own institutions that run parallel to the established system, such as the recent Asian Infrastructure Investment Bank (AIIB), is a predictable reaction to these perceived injustices. If the United States really wants China to become a “responsible stakeholder” in the global economic order, it must engage with China to let it become a serious shareholder as well. If successfully concluded, TPP will be one of the world’s largest trade deals, including 12 of the most important Pacific rim economies other than China. Policymakers in Washington rarely try to hide the fact that TPP is a tool for reassuring allies of the United States’ preeminence in the region as part of the “pivot to Asia.” However, instead of preventing China from writing the rules of trade, TPP may provide China with a convenient excuse to further push regional trade deals such as the Regional Comprehensive Economic Partnership (RCEP), a proposed ASEAN-led trade block that does not include the United States. As a result, the U.S. would have no influence over trade standards in these parallel trade agreements and over China’s future trade endeavors. Similar attempts to launch rival initiatives are already under way, and one does not need to look far for examples. China’s push to establish the AIIB is a reaction to America’s long-standing reluctance to reform global financial institutions. Take, for instance, the U.S. Congress’s reluctance to agree on a reform of voting shares in the International Monetary Fund (IMF), which would more adequately reflect the increasing economic power of emerging economies like China. Beijing’s frustration is understandable. In the IMF, China only has about 4 percent of voting power, while the U.S. holds almost 17 percent. The imbalance is similarly pronounced in the Asian Development Bank, where Japan and the United States together possess a quarter of votes, in contrast to China’s mere 5 percent. Considering that China currently accounts for over 13 percent of global output in dollar terms, it has a legitimate interest in the reform of both institutions. America’s heavy-handedness in dealing with a rising China can also be seen in currency issues. The IMF is set to review its Special Drawing Rights (SDR) currency basket in late 2015 and China is pushing for the yuan to be included. Many in the U.S. oppose the inclusion of the yuan as an IMF reserve currency on the basis that it is artificially undervalued. An official announcement by the IMF that it no longer considered the yuan undervalued faces strong disagreement from the U.S. government. Even in the TPA negotiations, members of Congress were keen to link the vote on TPA to a bill primarily aimed at addressing China’s currency manipulation. The fact that China is not even part of TPP shows to what lengths American politicians will go to single out China (there’s been no mention of TPP members such as Malaysia and its undervalued ringgit). China has a genuine interest in the yuan’s inclusion into the SDR, the prospect of which gives the U.S. some leverage over China’s currency policy. Many of China’s recent steps to reform its domestic financial sector, such as liberalizing interest rates or loosening capital controls, are seen as aiming to pave the way for the yuan’s inclusion into the SDR. But if China calculates that this prospect will be blocked indefinitely, it may choose to take a different path and dramatically slow down its efforts to internationalize the yuan, contrary to the demands of the U.S. and investors. The U.S. rationale for excluding China is short-sighted because it rests on the premise that economic relations constitute a zero-sum game. From this perspective, every inch of concessions leads to a loss of equal measure in American power. What matters in the economics of investment and trade, however, are absolute gains rather than relative gains. And in absolute terms, America would benefit more from the integration of China into a well-governed and cooperative economic order than from a divided world economy with multiple co-existing institutions and trade agreements, in some of which the United States would wield little to no influence at all. Proponents of a confrontational policy toward China claim that the country would not want to join TPP even if it were invited, because China has an inherent interest in rivaling American initiatives. As a matter of fact, before the Obama administration began advertising TPP as a geopolitical tool, China did not rule out joining the deal. And in a recent interview, Obama even hinted at a possible Chinese interest in participating. After all, the trade agreement would include four of China’s ten most important trading partners. In the same vein, arguments that previous attempts to lure China into the U.S.-led system have not worked fail to appreciate the significance of, for example, China’s accession to the World Trade Organization in 2001 and its willingness to make adjustments in domestic industrial policy, moving toward trade liberalization. U.S. policy runs contrary to Robert Zoellick’s famous call for China to become a “responsible stakeholder” in the international order. The only way to promote this is to let China become a “shareholder” in global governance. To that end, reforming the “rules of the game” such voting rights is necessary, but no longer sufficient. China must be actively incentivized to cooperate in trade and monetary affairs. It must have a substantial share in TPP and in global financial institutions. Only then will harmonized global trade rules and an effective Bretton Woods system again be internalized into the Chinese national interest. Needless to say, the Chinese leadership will also have to realize that it needs to implement important reforms such as curbing discrimination against foreign firms and strengthening the protection of intellectual property. All this will require concessions from the established powers, but a China that acts outside of the system is sure to be an even greater loss. The current strategy reduces the legitimacy of America’s liberal economic order, from which the country benefits so tremendously. Robin Hsieh is a researcher at the Global Public Policy Institute (GPPi) in Berlin. In selling TPP, why does Obama avoid extolling the virtues of free trade? Should the Rest of Southeast Asia Join the TPP?How the TPP Could Prevent Currency ManipulationForging the Trans-Pacific Partnership: An Insider's TakeThe CPTPP Trade Agreement Will Enter Into Force on December 30What Does 'Competition' Between the United States and China Really Mean?